This week, Brazil’s Jair Bolsonaro became the second prominent rightwing world leader to step up his support for Jerusalem being Israel’s capital, thus joining President Donald Trump in showering Benjamin Netanyahu with diplomatic gifts in the run-up to Israel’s April 9 election. Inside Jerusalem itself, the Israeli government’s push to encircle, suffocate, and expel the city’s 320,000 Palestinians has greatly intensified in the months since the U.S. Embassy moved there. What these Palestinians now face can be seen as the Fourth Wave of a decades-long Zionist assault on their presence and institutions in the holy city. The First Wave occurred back in 1948. The UN’s 1947 Partition Plan decreed that Jerusalem, Bethlehem, and a broad swathe of land around them should be made an “international city,” separate from the Palestinian Arab and Jewish statelets around it. That never happened. Jewish/Israeli fighters took over West Jerusalem and the Jordanian Army took over East Jerusalem (including the historic, walled Old City), along with the rest of the West Bank. West Jerusalem, where many upper and middle-class Palestinians had lived in gracious, beautiful homes, was thoroughly ethnically cleansed by the Israelis. Most of those expelled ended up living, many in deep poverty, in the east of the city. The Jordanians meanwhile expelled a much smaller number of Jewish residents from East Jerusalem but allowed the Hebrew University to retain its campus there. Jordan’s British-backed monarchs never allowed self-rule for the Palestinians of East Jerusalem or the rest of the West Bank. They simply annexed it all to their own “East Bank” land, exerting their dictatorial rule over East Bankers and West Bankers alike. The Second Wave of Zionism’s assault on Palestinian Jerusalem started in 1967. In the short Arab-Israeli war of that year, the Israeli military captured East Jerusalem, the rest of the West Bank, Gaza, Golan, and Sinai. The first steps it took to transform and Judaize any of the newly occupied areas were those it took in East Jerusalem. Israel also speedily reclaimed control of the ancient Jewish Quarter of the Old City while it destroyed the ancient Moghrabieh (Moroccan) Quarter—to make space for the broad plaza in front of the Western Wall. And it built a string of large new Jews-only settlements within the new city boundaries. For the first 27 years after 1967, the Israeli overlords of Jerusalem treated the East Jerusalem Palestinians in much the same way their military counterparts in the rest of the West Bank, or Gaza, treated the Palestinians there. They seized, exploited, or transformed Palestinian private and public lands as they wished. They undertook wide arrest campaigns and tortured many arrestees. They shamelessly ripped off the economies of these captive markets and tightly censored Palestinian media. After 1967, the Israelis built scores of settlements across the whole of the West Bank– but especially in East Jerusalem. In a small portion of these cases, they claimed that the arriving settlers (or their forebears) had owned those properties before 1948. But not a single Palestinian in Jerusalem or elsewhere was allowed, reciprocally, to reclaim properties that they had been expelled from that year. But still, during the years 1967-94, the Palestinians of the West Bank and Gaza could travel fairly easily travel across the whole of the area now under Israel’s control. In December 1987, after the Palestinians of the West Bank and Gaza had lived under occupation for 20 years, they launched the lengthy campaign of active civil resistance called the First Intifada. Its planning headquarters was in East Jerusalem. Emissaries of the political and civil-society groups running the intifada would gather there from throughout the West Bank and Gaza to coordinate plans and issue their monthly action calls. When I was researching the First Intifada, I found it easy to drive from Jerusalem to almost anywhere in the West Bank—though there were sometimes Israeli “flying checkpoints” to avoid—or even down to Gaza. Near Gaza, we’d park the car in a chicken coop near Nahal Oz and simply walk the last few yards into the Strip. The Third Wave of the Zionist assault on Jerusalem started in 1993-94, after the Palestinian Liberation Organization’s conclusion of the Oslo Accords with Israeli Prime Minister Yitzhak Rabin. Oslo “gave” the PLO some things its leaders valued. Many of them were allowed to “return” to Gaza and the West Bank to run the “Palestinian Interim Self-Governing Authority” (PA) born from the accords. The PA was allowed to set up– under strict Israeli supervision– its own education, health, justice, and policing systems within the land blobs of “Areas A and B”. They were promised that negotiations on a final-status agreement would be completed within five years. But at Oslo, the PLO leaders gave up a lot. They received no guarantees about either the timing of the final-status peace, or its content. They agreed that the newborn PA would act under Israel’s supervision for as long as the interim status lasted. (Now 25 years and counting.) They gave up on insisting on a halt to settlements—indeed, they said the Israeli government could build new roads to tie the settlements even more closely to each other and the Israeli heartland. And they effectively gave up on the PLO’s longstanding demands on both the return of refugees and Jerusalem. The fallout in Jerusalem was rapid. Rabin was adamant that the PA should exercise zero authority in East Jerusalem. When the PLO’s leaders “returned” to the West Bank after decades of exile elsewhere, he refused to allow them even to enter Jerusalem, insisting they set up their PA in the small town of Ramallah, instead. Rabin’s government rapidly set up a ring of semi-permanent checkpoints all around East Jerusalem, that for the first time ever cut it off completely from its West Bank hinterland. (People in cars with distinctive Israeli yellow plates could go through these checkpoints easily. Those with West Bank plates, never. In 1995, I made a lengthy reporting trip to Jerusalem. Some of my most poignant moments were spent interviewing people in the Old City, or some of the numerous East Jerusalemites who were refugees from West Jerusalem—or Faisal Husseini, the much-respected Palestinian leader who was holed up in the research center he ran in the Sheikh Jarrah neighborhood, as Jewish extremists camped outside it, harassing everyone entering or leaving. Husseini always looked exhausted. Along with the other leaders who had suffered during the First Intifada, he had insisted throughout those years that only the PLO could represent the Palestinians. But then, when it did so at Oslo, he realized the PLO’s leaders had no understanding of the situation in the occupied territories and had gotten the Palestinians a terrible deal. Especially regarding Jerusalem. He felt badly betrayed by Yasser Arafat, though he tried hard to hide that. In 2001, Husseini was found dead in a hotel room in Kuwait in a possible Mossad assassination. Since then, Jerusalem’s Palestinians have not had any leader of his authority—but their quiet, determined resistance to Israel’s assaults has continued. Most notably, in summer 2017, a series of mass Muslim “pray-in’s” in the Old City forced Israel to end a plan to erect metal-detectors at entrances to the sacred Haram al-Sharif. Last summer, Trump’s moving the U.S. embassy to Jerusalem opened the floodgates for the Fourth Wave of Israel’s assaults on the city’s Palestinians. On the ground, this Fourth Wave will likely see greater government support for projects to extend the extremist settlers’ matrix of control over all parts of the Old City. It will see city and central government planners working to complete and connect a tight “noose” of Jews-only settlements and Zionized tourist attractions around the Old City, including in Sheikh Jarrah, at-Tur, and Silwan… along with continued construction in outer-Jerusalem settlements like Giv’at Ze’ev, Ma’ale Adumim, or Gilo. The PA’s sclerotic leadership in Ramallah is unable, probably unwilling, to do anything to save what remains of Palestinian Jerusalem. The UN is hog-tied by Washington’s veto. Jordan may be able to play a key role, since it retains some responsibility for Jerusalem’s Muslim and Christian holy sites—and its national population also has a majority of heritage Palestinians. But global civil society, especially in the countries most supportive of Israel, needs to step up. Otherwise, this current Fourth Wave of Zionism’s assault on Palestinian Jerusalem could be the one that destroys it for generations to come. You forgot the part about the Jordanian Law of Nationality, when the residents of East Jerusalem and the West Bank were granted Jordanian citizenship. The “first wave of assault” on Jerusalem is presented to us as the non-fulfillment of the UN Partition Plan of 1947 in which Jerusalem was supposed to be an international city. The author tells us succintly: “That never happened”. That’s true, of course, and it’s also true that the Jews took over the western part of the city and the Jordanians took over the eastern part. However, out of fairness and in a minimal attempt at objective journalism, our author could have mentioned that the Palestinians absolutely rejected the Partition Plan. It would even be more fair if our author would have noted that even today the Palestinians do not accept the Partition Plan, and they envision the city’s being part of their future state (the entire city). By neglecting this little detail, our author leaves the impression that the non-fulfillment of the Partition Plan is a Palestinian grievance. That’s propaganda at its best: Without actually making a false statement, she presents a false narrative. Mr Abbas did the same trick in 2012 on the eve of the UN’s decision to accept the State of Palestine as a non-member observer state. Mr Abbas wrote in the NY Times that the UN promised the Palestinians a state in the 1947 Partition Plan, and that promise was not kept. Just like our author, Mr Abbas didn’t think that it was important to mention that he absolutely rejects the Partition Plan. Speaking of supposed unfulfilled promises, our author tells us that the Palestinians “were promised that negotiations on a final-status agreement would be completed within five years”. That’s really a tricky statement. There was no “promise”; rather, the Palestinians and the Israelis agreed in Oslo to reach an agreement within five years. It could be that side “a” blames side “b” (and side “b” blames side “a”) that the agreement wasn’t reached; however, reality is that the Palestinians are also responsible for reaching or not reaching an agreement. There are two sides to negotiations, and the Palestinians are one of those two sides. And speaking of responsibility, it should be added that in the Partition Plan the two sides were responsible for founding their states. There was no promise to found an Arab state (or a Jewish state). Mr Abbas’ presentation leaves the impression that someone else should have founded his state for him, and that someone else let him down. He’s an historian, so he should know that the Arab League founded the “All Palestine” government in Gaza in Sept 1948, and the mufti Hajj Amin al-Husseini was appointed president. The mufti declared statehood over all of Palestine with Jerusalem as his capital, although in reality the state was in the Egyptian-controlled areas of the country. This Palestinian state was recognized by Egypt, Syria, Lebanon, Iraq, Yemen and Saudi Arabia – but not by Jordan or any non-Arab state. In 1959, President Nasser of Egypt dissolved the state. Finally, it was interesting to read that Faisal Husseini was found dead in a hotel room in Kuwait in “a possible Mossad assassination”. By saying that it was a “possible” assassination, our author cannot be accused of writing a falsehood. I suppose that it’s a “possibility”. It’s also possible that he had cardiac arrest which, strangely, is not worthy of mention in the article. That’s the method of propaganda. Without actually making a false statement, one presents a false narrative. Nathan: ….the Palestinians do not accept the Partition Plan, and they envision the city’s being part of their future state (the entire city). The Palestinians have officially accepted far LESS than what the Partition Plan allotted to them–they’ve accepted the 1967 “Green Line” border established via the 1949 Armistice Agreements. And they claim only East Jerusalem, not the entire city. What is the 1967 border? Does the recognition of the State of Palestine in the 1967 border represent an attempt to delegitimize the State of Israel? Because Israel, backed by the U.S., has done everything possible to undermine a two-state solution based on the international consensus one state solutions are now being increasingly advocated. Sibiriak – May I assume that you have never read a word in Arabic in your life? You really don’t understand the Palestinian method of making politics. When the Palestinians express a willingness to negotiate a two-state arrangement based on the 1967 lines, this does not mean that they have accepted a state in territory smaller than the 1947 Partition Plan. When they demand that East Jerusalem be the capital city of the future Palestinian state, it does not mean that they have accepted that West Jerusalem is the capital of Israel. All it means is that the next chapter in the history of the struggle is that there will be a Palestinian state in the West Bank, and East Jerusalem will be the capital city. The conflict, however, is not solved, and the struggle goes on. The same is true about recognition of Israel. In order to achieve the Oslo deal, Arafat had no choice but to recognize Israel – so he recognized Israel, and so he turned the page to the next chapter of the conflict. But do the Palestinians recognize Israel (in the present tense)? Absolutely not. Listen carefully when a Palestinian spokesman refers to the issue of recognition. It is always stated in the past tense: “We recognized Israel”. And that is a true statement. But they do not recognize Israel (in the present tense), period. There is no intention of ending the conflict with Israel. Since it is not possible to defeat Israel (which is what they really want), they have no choice but to engage in diplomacy. So, they’ll negotiate for a state in the Green Line, but the Green Line remains illegitimate in their eyes. They’ll accept East Jerusalem as their capital city, but Israel has no right to West Jerusalem. They aspire to rule the entire city. They’ll accept a West Bank state, but the Jews have no right to a state. They aspire to rule the entire country. This truth should be clear even when reading a website like Mondoweiss, but when you can read a newspaper in Arabic, you simply can’t miss the intention of the Palestinian side. – are entitled to “return” to it / colonize it / establish a religion-supremacist state in it. Yes, the Palestinians “rejected the Partition Plan.” No surprise!! No wonder Palestinians rejected the recommendatory only Partition Plan. Indeed, it proved so unworkable that when Polish born David Ben-Gurion (nee, David Gruen) et al. declared the “Jewish State” of Israel effective 15 May 1948, after Jewish forces had already dispossessed and expelled 400,000 Palestinians (e.g., 30,000 from West Jerusalem in March and a further 30,000 in May, 60,000 from Haifa in April, 75,000 from Jaffa in late April and early May), the UNGA was in the process of shelving the Partition Plan in favor of a UN Trusteeship. During the war Israel seized 78% of Palestine (22% more than proposed by the recommendatory only UNGA Partition Plan, Resolution 181, including large portions of the proposed Palestinian state, e.g., Jaffa and Acre.) After driving out about 400,000 between late 1947 and 15 May 1948, Jewish Zionists of foreign origin expelled 400,000 more Palestinians for a total of about 800,000 (according to Walter Eytan, then Director General of the Israeli Foreign Ministry) and went on to destroy over 500 of their towns and villages, including churches, mosques and cemeteries. It was only the beginning of the Zionist’s conquest of Palestine and the expulsion of its indigenous Arab inhabitants. By June, 1967, about 1,200,000 were dispossessed and driven out. this is devastating, so depressing. “The 350,000 Palestinian inhabitants of occupied East Jerusalem are caught between a rock and hard place, as Israel works ever harder to remove them from the holy city in which they were born, analysts and residents warn. “That process, they say, has only accelerated in the wake of US President Donald Trump’s decision a year ago to relocate the American embassy to Jerusalem, effectively endorsing the city as Israel’s exclusive capital. “’Israel wants Palestinians in Jerusalem to understand that they are trapped, that they are being strangled, in the hope they will conclude that life is better outside the city,’ said Amneh Badran, a politics professor at Jerusalem’s Al Quds university. “Since Israel seized the eastern part of Jerusalem in 1967 and then illegally annexed it in 1981, it has intentionally left the status of its Palestinian population unresolved. “Israeli officials have made Palestinians there ‘permanent residents,’ though, in practice, their residency is easily revoked. According to Israel’s own figures, more than 14,500 Palestinians have been expelled from the city of their birth since 1967, often compelling their families to join them in exile. “Further, Israel finished its concrete wall slicing through East Jerusalem three years ago, cutting some 140,000 Palestinian residents off from the rest of the city. “A raft of well-documented policies – including house demolitions, a chronic shortage of classrooms, lack of public services, municipal underfunding, land seizures, home evictions by Jewish settlers, denial of family unification, and police and settler violence – have intensified over the years. “At the same time, Israel has denied the Palestinian Authority, a supposed government-in-waiting in the West Bank, any role in East Jerusalem, leaving the city’s Palestinians even more isolated and weak. “All of these factors are designed to pressure Palestinians to leave, usually to areas outside the wall or to nearby West Bank cities like Ramallah or Bethlehem. “’In Jerusalem, Israel’s overriding aim is at its most transparent: to take control of the land but without its Palestinian inhabitants,’ said Daoud Alg’ol, a researcher on Jerusalem. “Like others, Mr Alg’ol noted that Israel had stepped up its ‘Judaisation’ policies in Jerusalem since the US relocated its embassy. ‘Israel is working more quickly, more confidently and more intensively because it believes Trump has given his blessing,’ he said. “City boundaries were expanded eastwards to attach additional Palestinian lands to Jerusalem and then fill in the empty spaces with a ring of large Jewish settlements, said Aviv Tartasky, a researcher with Ir Amim, an organisation that campaigns for equal rights in Jerusalem. “The goal, he added, was to shore up a permanent three-quarters Jewish majority – to ensure Palestinians could not stake a claim to the city and to allay Israeli fears that one day the Palestinians might gain control of the municipality through elections. “Israel has nonetheless faced a shrinking Jewish majority because of higher Palestinian birth rates. Today, Palestinians comprise about 40 per cent of the total population of this artificially enlarged Jerusalem. “Israel has therefore been aggressively pursuing a twin-pronged approach, according to analysts. “On one side, wide-ranging discriminatory policies – that harm Palestinians and favour Jewish settlers – have been designed to erode Palestinians’ connection to Jerusalem, encouraging them to leave. And, on the other, revocation of residency rights and the gradual redrawing of municipal boundaries have forcibly placed Palestinians outside the city – in what some experts term a ‘silent transfer’ or administrative ethnic cleansing. “Israel’s efforts to disconnect Palestinians from Jerusalem are most visibly expressed in the change of Arabic script on road signs. The city’s Arabic name, Al Quds (the Holy), has been gradually replaced by the Israeli name, Urshalim, transliterated into Arabic. “The lack of services and municipal funding and high unemployment mean that three-quarters of Palestinians in East Jerusalem live below the poverty line. That compares to only 15 per cent for Israeli Jews nationally. “Despite these abysmal figures, the municipality has provided four social services offices in the city for Palestinians, compared to 19 for Israeli Jews. “Only half of Palestinian residents are provided with access to the water grid. There are similar deficiencies in postal services, road infrastructure, pavements and cultural centres. “Meanwhile, human rights groups have noted that East Jerusalem lacks at least 2,000 classrooms for Palestinian children, and that the condition of 43 per cent of existing rooms is inadequate. A third of pupils fail to complete basic schooling. “But the biggest pressure on Palestinian residents has been inflicted through grossly discriminatory planning rules, said Mr Tartasky. “In the areas outside the wall, Palestinians have been abandoned by the municipality – and receive no services or policing at all. “Israel’s long-term aim, said Mr Tartasky, had been exposed in a leak of private comments made by Israeli Prime Minister Benjamin Netanyahu in 2015. He had proposed revoking the residency of the 140,000 Palestinians outside the wall. “’At the moment, the government is discussing putting these residents under the responsibility of the army,’ Mr Tartasky said. “That would make them equivalent to Palestinians living in Israeli-controlled areas of the West Bank and sever their last connections to Jerusalem. “Meanwhile, on the inner side of the wall, Palestinian neighbourhoods have been tightly constrained, with much of the land declared either ‘scenic areas’ or national parks, in which construction is illegal, or reserved for Jewish settlements. The inevitable result has been extreme overcrowding. “In addition, Israel has denied most Palestinian neighbourhoods’ masterplans, making it all but impossible to get building permits. “An estimated 20,000 houses – about 40 per cent of the city’s Palestinian housing stock – are illegal and under threat of demolition. More than 800 homes, some housing several families, have been razed since 2004.
neighbourhoods, often with the backing of the Israeli courts. “Mr Tartasky noted that Israel has been accelerating legal efforts to evict Palestinians from their homes over the past year, with close to 200 families in and around the Old City currently facing court battles. “When settlers move in following such evictions, Ms Badran said, the character of the Palestinian neighbourhoods rapidly changes. “In Silwan, where settler groups have established a touristic archaeological park in the midst of a densely populated Palestinian community just outside the Old City walls, life has been especially tough. “Mr Alg’ol, who lives in Silwan, noted that fortified settler compounds had been established throughout the area, many dozens more Palestinian families were facing evictions, excavations were taking place under Palestinian homes, closed-circuit TV watched residents 24 hours a day, and the security services were a constant presence. Many hundreds of children had been arrested in recent years, usually accused of stone throwing. “Israel’s newest move is the announcement of a cable car to bring tourists from West Jerusalem through Palestinian neighbourhoods like Silwan to the holy sites of the Old City. “Mr Alg’ol’s family was one of many in Silwan that had been told their lands were being confiscated for the cable car and a new police station. 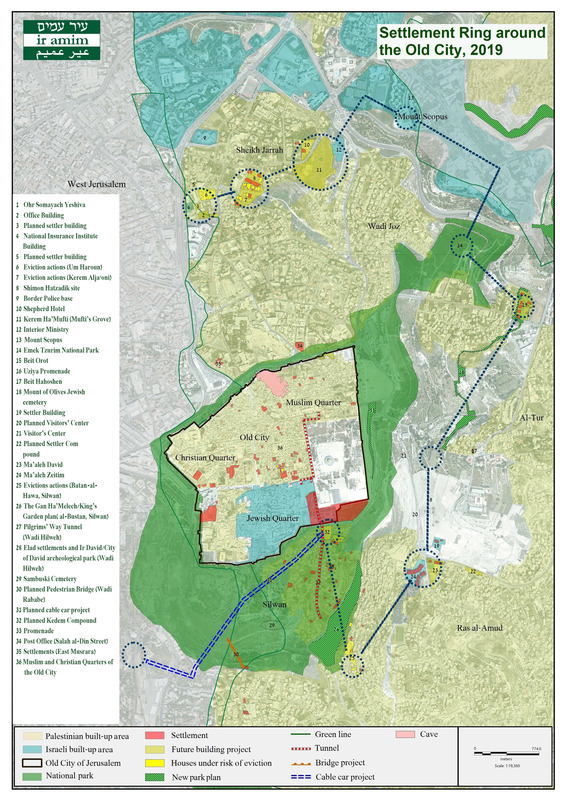 This map from the good, Israeli, Jerusalem-rights org Ir Amim shows the presently pursued “noose” being created around Jerusalem: http://www.ir-amim.org.il/sites/default/files/Settlement%20Ring%20around%20the%20Old%20City%202019%202%2004.jpg. Re Faisal Husseini’s very mysterious death in 2001, the questioning about its cause accelerated after the Mossad were caught having killed Hamas operative Mahmoud al-Mabhouh in a hotel room in Dubai in 2010, with physiological sequelae to their action then that were reportedly very similar to those of Faisal Husseini’s death. We’ll be expanding on several of these points in the audio complement to this article that will be released on Just World Podcasts tomorrow or Saturday. Check out this and all the audio portions of my current “Story-Story” project there– or you can subscribe to Just World Podcasts via iTunes or wherever else you get your podcasts . thank you helena. that’s interesting about Husseini’s death, i look forward to hearing the new podcast. listening to the conversation with ambassador ford about the golan i’m reminded of something i asked last week in the comments, i should have asked you specifically. can this golan recognition be reversed by a future president? can the embassy be moved back to tel aviv with another president? what does it mean if a future president recognizes the land grab as illegal? Husseini died of a heart attack. What’s interesting is the willingness to swallow (and print) any concoction so long as it impugns Israel. spoken like a true hasbrat representing the runner up for the lying-est government on the face of the planet. hey nut, does israel have nukes yet? or is that still on the down-low? Other than spurious allegations, and your obvious gullibility, where is there any serious allegation of wrong-doing in his death? Have the Palestinians accused Israel? Has any major publication done so? Is there even a shred of evidence to back this nonsense of yours? And how would the presence of nukes in Israel, which Israel does not deny, in any make your fantasy more believable? Rise and Kill First by NY Times journalist Ronen Bergman is a book worth reading. Remi Brulin writes the following in ‘Terrorism’ and antisemitism. Never, in all of history, has the holy city of Jerusalem been as accessible to all three monolithic religions, as it is now. Let Islamic characters take control and you know exactly where it will go. The Muslim world has provided enough evidence to back this up. And, pray tell, which are the “three monolithic religions”? Of course, I realize the answers aren’t carved in a single block of stone or anything. If you mean monotheistic religions, you should remember that there are more than three. For example, Sikhs and Baha’is are monotheists. And there are more Sikhs than there are Jews. Helena Coban conveniently forgets to tell us that at Camp David II talks between Yasar Arafat, Ehud Barak and Bill Clinton, Ehud Barak offered Arafat sovereignty over everything above ground on the Temple Mount with Jews retaining sovereignty with everything below ground. Now who would not take an offer like that. I can tell you for one, Jews with any pride would not. But as history went, it was Arafat who rejected the offer. So don’t come with your crocodile tears Ms. Coban. The Palestinians apparently do not want the responsibility of running a country and to be in a position where they are prepared to share with Jews. For them its everything or nothing. Now if you have failed to understand this, then look into a mirror to see where the problem lies.